InterContinental Hotels Group has unveiled its latest opening - InterContinental Bordeaux - Le Grand Hotel, France. 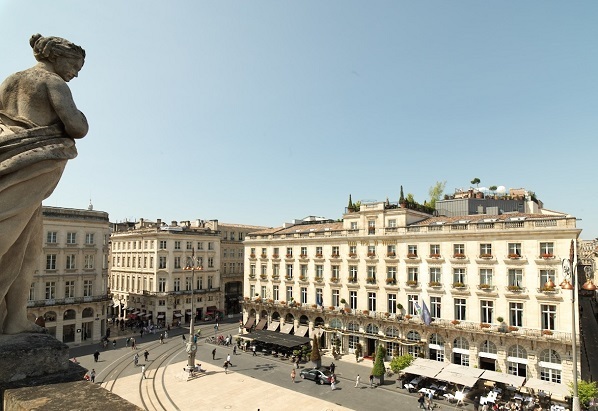 The hotel has been elegantly converted from the current Grand Hôtel de Bordeaux & Spa and is IHG’s fifth InterContinental Hotels & Resorts property in France. The historic building was stylishly refurbished by French Architect and Designer, Jacques Garcia, with rich colourful design typical of his opulent style, while preserving the property’s 18th century splendour. The hotel commands pride of place on Bordeaux’s main square, Place de la Comédie, among high-end boutiques and world-class restaurants. Bordeaux was classified as a UNESCO World Heritage Site in 2007. The hotel features 130 rooms including 44 suites, and also offers a range of fitness and wellness facilities including an indoor pool and hammam, ten treatment rooms and a Jacuzzi on the 360° rooftop beach, which beautifully recreates the atmosphere of a summer’s day in the Bay of Arcachon. The Gordon Ramsay Group headed by the internationally renowned, multi-Michelin starred chef Gordon Ramsay, brings international flair to the fine dining restaurant, Le Pressoir d’Argent Gordon Ramsay. Angela Brav, chief executive, Europe, IHG said: “We’re very proud to be opening this iconic hotel in the centre of a legendary winegrowing region and one of Europe’s most elegant cities. “With France being one of our most important markets and Bordeaux receiving over five million visitors per year, this move is very much in line with our strategy to expand our award-winning InterContinental Hotels & Resorts brand in the most popular tourist destinations. The hotel will operate under a management agreement with Financière Immobilière Bordelaise. With 182 InterContinental Hotels & Resorts open worldwide and more than 50 hotels in the global development pipeline, IHG continues to expand the brand’s portfolio in the most sought-after destinations around the world.